Remarks: In May 1987, the tender of this engine was rammed by a railroad car and now needs repairs. Engine needs new front tube sheet and flues. History: Of the four 2-8-0 Consolidation-type locomotives i the Steamtown collection, this comparatively small short line railroad engine has probably the most aesthetically pleasing design. With a lower, smaller boiler than the Illinois Central or Maine Central engines, the little locomotive has a more balanced appearance than the other three 2-8-0s in the collection. Its history reflects the role of short line railroads in the American rail transportation network, in which they served as essential feeders to the major Class 1 carriers. Incorporated on September 18, 1913 to build from Oneida, Tennessee, to Albany, Kentucky, the Oneida & Western Railroad ordered its Locomotive No. 20 from the Baldwin Locomotive Works. Delivered in June 1916 when the Oneida & Western was but three years old, the trim little Consolidation went to work in the hills of Tennessee. Intended to spur the development of coal and lumber properties, the Oneida & Western disappointed its supporters and became a short line stretching only 25 miles from Oneida to East Jamestown, Tennessee. At Oneida, the short line connected with the Cincinnati, New Orleans and Texas Pacific Railway. Aside from its fine proportions, Engine No. 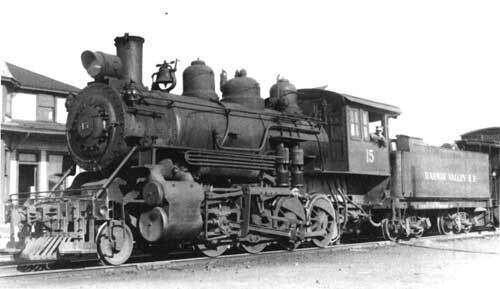 15 reportedly became the favorite locomotive of her regular O & W engineer. Despite a narrow firebox, the engine performed well in the hands of crews who knew how to handle her. Baldwin Locomotive Works photograph Oneida & Western Railroad 2-8-0 No. 20 in June 1916, in its fresh builder's paint job (top), and some time later an unidentified photographer recorded her appearance in a yard in Tennessee (bottom). Both views illustrate the locomotive's original pistons and cylinders and her original "pilot" or cowcatcher. Top, collection of Mallory Hope Ferrell. Built with fairly common Walschaert valve motion and standard slide valves, the engine retained that character only for her first 10 years. About 1926 a neglectful hostler allowed the engine to freeze one cold night, and the expanding ice broke the bridges. 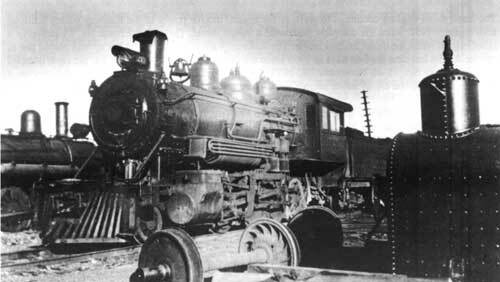 The company apparently shipped the locomotive to Baldwin's Eddystone Shops for repair, and for reasons unknown, Baldwin fitted the locomotive with new piston valves, employing outside admission to avoid altering the valve gear. It was a common practice to retain the old-style admission on locomotives refitted with universal valve chests, but it was an unusual feature on an engine just given new cylinders. Furthermore, the use of outside steam pipes that branched above the valve chests made Oneida & Western No. 20 a unique locomotive. It was apparently at this same time that Baldwin applied a Franklin Type B Ragonnet power reverse mechanism and a mechanical lubricator, as well as a standard steel pilot in place of the hardwood pilot and electric headlight and markers in place of the oil (kerosene) headlight and marker lights. Back in the hills of Tennessee, the locomotive returned to her duties on the Oneida & Western. By 1937, the little engine had performed faithfully for 21 years, and Oneida & Western management (by then the road had entered bankruptcy and was operating under a trustee) considered the locomotive somewhat tired and small for their needs and began thinking of buying larger motive power. Thus No. 20 became surplus, and the frugal company put her up for sale in August 1937 through the Birmingham Rail and Locomotive Company. Charles Nees, master mechanic of the Rahway Valley Railroad of New Jersey, came to Tennessee with an eye toward purchase of the engine. Older than the O & W, the Rahway Valley Railroad had been incorporated back on July 18, 1904, to acquire the 4-mile-long New Orange Four Junction Railroad and extend it to new destinations. The Rahway Valley linked New Orange, later renamed Kenilworth, with the Lehigh Valley at Roselle Park and the Central Railroad Company of New Jersey, and then reached at the other end for a connection with the Delaware, Lackawanna & Western Railroad at Summit. Promoter of the Rahway Valley was Louis Keller, rumored to have gone into the railroad business to give himself and his golfing buddies easy transportation to the Baltusrol Golf Club he had founded near Summit. Indeed, construction of the new line proceeded past the golf links to within a few feet of the Lackawanna line near Summit, and there the plans of the Rahway Valley Railroad unraveled, for the Lackawanna refused to allow a connection to their tracks. Instead of serving as a connection in New Jersey between the Lehigh Valley and the "Jersey Central" at one end and the Lackawanna at the other, the little Rahway Valley was frozen into being a short line feeder only to the two connections at its southern end. Meanwhile, the Rahway Valley initiated a schedule of 14 passenger trains, whose principal patrons indeed proved mostly to be "blue-chip fellows" heading for the golf club, but this did not last. Frequency of passenger trains had dwindled to six by 1909, and in 1911 the railroad turned to the development of further freight traffic as its bread and butter by constructing a 3-mile branch line to Maplewood, later renamed Newark Heights. The Rahway Valley abandoned all passenger traffic in 1919, and thereafter handled freight only. After World War I, Roger Clark, a short line railroader with extensive experience on the Buffalo, Rochester & Pittsburgh and later on the Central Railroad of Oregon, came to the Rahway Valley, bringing along his son, George, a former lumberjack. When Louis Keller died in 1921, Roger Clark became president of the Rahway Valley, and George became the line's traffic manager. They nursed the little short line through deficit after deficit during the 1920s, when red ink seemed to pour onto the railroad's books. Ironically, it was just as the Depression hit in 1929 that the Clarks began to pull the Rahway Valley out of its pool of red ink, and indeed the Depression marked the start of the short line's era of profit. The Clarks managed in 1929 to find funds with which to buy two secondhand Lehigh and New England Railroad 2-8-0 locomotives. That good fortune was followed by more: In 1931, the Lackawanna at long last allowed a connection between the two roads at Summit, New Jersey, which spawned further business. Roger Clark died in 1932, and George Clark became president. The Clarks' success with the road continued. In 1934, the company's books showed a net profit. Again in 1935 and in 1936 the line was in the black, and President Clark began to consider the need for a fourth 2-8-0 to supplement No. 12, a tired, old former Bessemer & Lake Erie engine, and Nos. 13 and 14, the two Consolidations obtained secondhand from the Lehigh & New England Railroad. It was then that he sent master mechanic Charles Nees down to Tennessee to look over Oneida & Western No. 20. A later view of Oneida & Western Railroad Locomotive No. 20 in the yard at Oneida, Tennessee, in June 1937, illustrated a rebuilt engine with a rather unique arrangement of cylinders. Note also the new "pilot" of steel tubes which replaced the original wooden one. 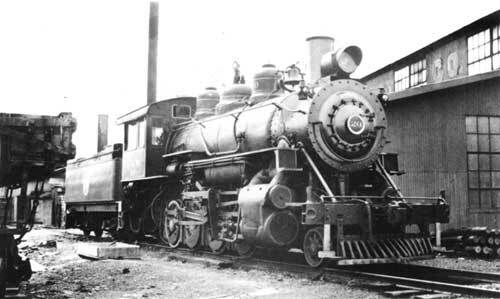 This engine later became Rahway Valley Railroad Engine No. 15. He couldn't see much of a fire; in fact, the grates were almost uncovered. Yet despite the long and narrow dimensions of a "cussed" type firebox, the 70-ton Consolidation he was riding had built up a good head of steam and was handling an ample load with obvious effort but seeming ease. That was Charles William Nees' first encounter with Oneida & Western No. 20, then (1937) with 21 years of Tennessee mountain service already behind her--and it sold him. In due time the unusual little Baldwin became Nees' charge as No. 15 of New Jersey's Rahway Valley R.R. . . . But on the Rahway Valley, whose No. 12 had been considered too large and been set aside for years, new No. 15 did not compare favorably with the pair of former Lehigh & New England Consolidations, deckless locomotives that were real workhorses. Matched against these twins, No. 15 came off third in performance. Everybody agreed that she was a well-fitted engine. But when it came to crew preferences, the older deckless engines were more powerful and had semi-wide fireboxes--and their closed cabs were wanner in winter. For a long time No. 15 was used sparingly during the cold months. Not everyone could stoke the new arrival successfully. Her design called for a clean but light fire, something never achieved without care. Even so, the handsome Consolidation remained the master mechanic's pet and the favorite of most observers. Her charms were even audible, in a clean exhaust and a melodious whistle on which Engineer Frank Froat could sound either muted, low tones or higher, louder notes of urgency. The admirers of that whistle are many, and Carl Nees, a man not given to oversentiment, always liked to tell how beautifully its notes echoed among the mountains of Tennessee. Perhaps not the most efficient engine, Rahway Valley No. 15 qualified as the line's most attractive. Traffic on the Rahway Valley proved not to be so heavy that the line needed to keep three locomotives in regular service, so with No. 12 eventually retired, Nos. 13 and 14 performed most of the work, with No. 15 serving as a spare locomotive to fill in when one of the others was in the shop. For major repairs, the Rahway Valley sent its locomotives to the Lackawanna's Kingsland Shops or the Central Railroad Company of New Jersey's Elizabethport shops, but No. 15, at least on one occasion went down to the Lackawanna's Scranton shops for repairs. The three steam engines continued to serve as the regular motive power of the Rahway Valley Railroad until January 1951, when the company purchased a 70-ton diesel. Thereafter, Engine No. 15 served as a relief engine when the diesel needed repair. The Rahway Valley Railroad fired her up and placed her in service for the last time for four days in 1953 when the diesel was down for repairs, and the crew dumped the last fire on No. 15 on November 28, 1953. Several weeks later, the company took delivery on a second diesel, and the era of steam motive power on the Rahway Valley Railroad had passed forever. "President Clark, who knew a good engine when he saw one," wrote the locomotive's historian, "was as reluctant as anybody to see No. 15 go for scrap. Pending developments, the engine remained well protected in a closed and heated shed, part of the diesel shop." By then F. Nelson Blount, president of the Edaville Railroad, had contracted to operate a railroad at the new Pleasure Island park in Wakefield, Massachusetts and purchased No. 15 for exhibit there. The Rahway Valley Railroad shipped the locomotive on June 5, 1959, via the Central of New Jersey, the Delaware & Hudson, and the Boston & Maine. Rahway Valley Railroad Locomotive No. 15 featured a front number plate and a headlight mounted on top of the smokebox, which is different from her present appearance in Scranton, Pennsylvania. The changes apparently were made on the Green Mountain Railroad. But old No. 15 refused to remain an idle exhibit engine, and Blount was not destined to remain involved at Pleasure Island. He moved his collection to Keene and then North Walpole, New Hampshire and finally across the river to Riverside, a meadow north of Bellow Falls, Vermont. While at North Walpole, he had Rahway Valley No. 15 overhauled and put back into service on his Monadnock, Steamtown and Northern Railroad, a tourist excursion line. When forced to move from Boston and Maine trackage at North Walpole across the river to Rutland Railroad trackage near Bellows Falls, he renamed the excursion line simply Monadnock Northern. There former Rahway Valley No. 15, former Oneida & Western No. 20, served so reliably and for so long that she came to be called the "faithful fifteen" During the winter of 1962-1963, the locomotive even ran up to Boston to play a role in a motion picture entitled "The Cardinal." No. 15 operated regularly from the beginning of the 1962 season until its "flue time" expired early in 1967. After Blount's death, in 1968 the Steamtown Foundation obtained from the Federal Railroad Administration an extension on the flue deadline, and the locomotive returned to service lettered for the Green Mountain Railroad, but after only a handful of runs, broke a piston, and limped into storage. In January 1973 the Steamtown Foundation obtained another flue extension, machined and installed a new piston and piston road, and modified the appearance of the locomotive by removing the front number plate and lowering the headlight to a position in the center of the smokebox door. Steamtown leased the locomotive for a run to Boston to carry a wealthy couple from their wedding to a reception a couple of towns away. After returning to Bellows Falls, Steamtown fired up the locomotive again as part of the "Friends of Steamtown" Day on August 12, 1973. While heading Steamtown's first triple-headed excursion with a couple of Canadian Pacific 4-6-2s, the locomotive blew a flue out just north of Riverside, badly scalding veteran engineer Andy Barbera. Inspection of the boiler indicated that reflueing and installation of a new front flue sheet should be completed before the locomotive operated again, and since the Steamtown Foundation did not need the services of No. 15 at that time, the work was not done. Just a day or two before the August 1973 excursion, the Steamtown mechanical force had placed a round number plate just below the headlight, giving the locomotive the appearance it has today. Briefly lettered Steamtown R.R.," the locomotive received from Steamtown volunteers during the early 1980s a new paint job and lettering that spelled out "Rahway Valley." Nevertheless, its present appearance is not its appearance when on either the Rahway Valley Railroad or the Oneida & Western. Condition: The engine needs to be restored either to her appearance on the Oneida & Western Railroad after the 1926 rebuild, or, perhaps preferably, to her appearance on the Rahway Valley Railroad, under whose ownership she was shopped in Scranton, and whose operations connected with the Delaware, Lackawanna & Western. Mechanically, the engine needs a new front tube sheet and new flues in order to operate. Furthermore, in May 1987, at the beginning of Steamtown excursion operations out of Scranton, the rear of the tender of this locomotive was damaged by vandals and requires repair. Recommendation: The National Park Service should commission a report on the subject of this locomotive. 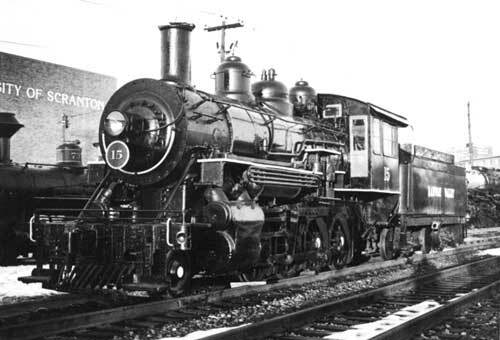 The report should recommend whether to restore this locomotive as a Rahway Valley locomotive or as an Oneida & Western locomotive as it appeared after its 1926 modifications. In terms of location, the Rahway Valley Railroad was better situated with respect to the Scope of Collections Statement, as it operated in that northeastern quarter of the United States identified as a particular focus for the collections of this institution, while the Oneida & Western in Tennessee lies south of that geographic area. Upon completion of the research and the report, No. 15 should be restored both cosmetically and mechanically to operable condition, and a schedule of operation for interpretive use should be established. The locomotive is too light for regular excursion train use to Moscow or Pocono Summit, Pennsylvania, but it could be used in switching around the Scranton yard or for small, occasional, special excursions and charter groups out on the main line, or for period freight trains for photographic purposes. Rahway Valley Railroad Locomotive No. 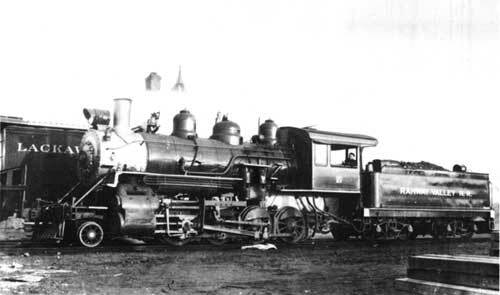 15 featured a front number plate and a headlight mounted on top of the smokebox, which made her look different from her present appearance in Scranton, Pennsylvania. "Across the Dispatcher's Table: Oneida & Western." Short-Line Railroader, Vol. 1, No. 3 (June-July 1954): 2. Beebe, Lucius, and Charles Clegg. Mixed Train Daily: A Book of Short-Line Railroads. Berkeley: Howell-North Books, 1961: 80, 284, 334. Bailey, Frederick G. Letter to the author, Mar. 26, 1991. Baldwin Locomotive Works. Specification Card for Locomotive No. 15, Oneida [&] Western, June 16, 1916. Copy in the Steamtown Foundation files. "A Championship Season." Railpace Newsmagazine, Vol. 3, No. 12 (Dec. 1984): 19. Cunningham, John T. "New Jersey's Streak o' Rust." Trains, Vol. 10, No. 12 (Oct. 1950): 36-40. Guide to the Steamtown Collection. Bellows Falls, Vt.: Steamtown Foundation, n.d. (ca. 1973): Item No. 15 and roster entry. Hyer, Richard, and John Zec. Railroads of New Jersey. n.p. : Author, 1975: 150-15 l.
Morgan, David P., and Philip R. Hastings. "Smoke over the Prairies, 12: The saddest train of all." Trains, Vol. 16, No. 3 (Jan. 1956): 14-16. "Oneida & Western." Short-Line Railroader, Vol. 1, No. 3 (June-July 1954): 2. "Oneida & Western Ending Hectic Career . . ." Short-Line Railroader, Vol. 1, No. 1 (Apr. 1954): 3, 4. Poor's Manual of the Railroads of the United States, 1913. New York: Poor's Railroad Manual Co., 1913: 256, 257. Poor's Manual of the Railroads of the United States, 1920. New York: Poor's Railroad Manual Co., 1920: 948, 949, 1119, 1120. Rahway Valley RR." The Short Line, Vol. 10, No. 4 (July-Aug. 1982): 11. Rahway Valley RR." The Short Line. Vol. 12, No. 6 (Nov.-Dec. 1984): 10. "Rahway Valley RR." The Short Line, 13 (Nov.-Dec. 1985): 10. Rahway Valley RR." The Short Line, 14 (Sept.-Oct. 1986): 5. "Railnews." Railfan & Railroad, 4 (May 1982): 22. Railroad Magazine, 31 (Jan. 1942): 64. Short-Line Annual, 1958. n.p. : Short-Line Railroader, 1958. See 19. "Steam! News Photos; Genuine G-5d in steam." Trains, Vol. 25, No. 3 (Jan. 1965): 15. "Steamtown Engine Roster, September 1967." Bulletin of the National Railway Historical Society, Vol. 33, No. 1 (1968): 8. "Three Little Sisters." Short-Line Railroader, No. 11 (Apr. 1965): 5. "Valuation Docket No. 500, Oneida & Western Railroad Company." Interstate Commerce Commission Reports. Decisions of the Interstate Commerce Commission of the United States. Washington, D.C.: U.S. Government Printing Office, 106 (1926): 479-49 l.
"Valuation Docket No. 685, Rahway Valley Company Et Al." Interstate Commerce Commission Reports. Decisions of the Interstate Commerce Commission of the United States. Vol. 119. Washington, D.C.: U.S. Government Printing Office (1927): 389-411.